Operate most three-point implements and move wagons with ease. The American-made Universal Adapter brings durability and value to your farm or ranch by allowing you to use the skid steer rather than bringing out your tractor for every little thing. 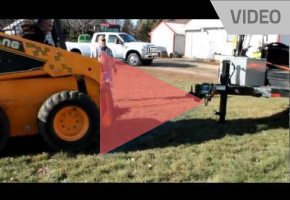 The Universal Adapter is a Universal skid steer mount on one side and a Cat. I and II on the other side. In some cases, you can even use tractor-mounted products on your skid steer without having to make an additional purchase. Operate most three-point tractor implements without starting the tractor. Check out the media available for Universal Adapter. Shaver's Universal Adapter can be used to move and use 3-point tractor mounted products. It comes equipped with a receiver for moving trailer products as well. Want more information on the Universal Adapter? Here are some helpful downloads.